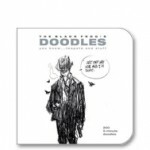 The Black Frog’s first published sketchbook, Doodles, is a compilation of 200 original pencil doodles featuring teapots, monsters, silly robots, and other weird characters and concepts. Each was doodled in five minutes or less. Igor-Alban Chevalier—a.k.a. The Black Frog—was born in Champagne, France in 1973. The only son of an antique dealer/art teacher, Chevalier grew up discovering the work of glorious comic book artists like Liberatore, Moebius, and Frank Miller. He spent four years as a creature designer at Jim Henson’s Creature Shop in London, and has designed for such films as Harry Potter and the Sorcerer’s Stone and X-Men 3. He now freelances in Los Angeles as a visual effects art director. Categories: Books, we made too much on the reprint.